Blood pressure measurement is a simple and risk-free examination through which you can get information about the functioning of your heart and circulation. Blood pressure can be observed in the arteries of the body’s circulatory system. With each heartbeat, it fluctuates between a maximum value (systolic) and a minimum value (diastolic). Measuring blood pressure usually takes place indirectly with help from an inflatable sleeve on the arm or on the wrist. 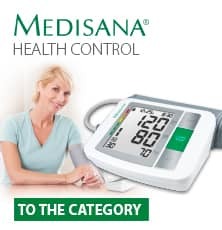 Many people do not even know that high blood pressure is so widespread: for example, over 16 million Germans are affected but only half are aware of the risks caused by their lifestyle because high blood pressure comes on quietly and remains undetected for a long time. And that’s what makes it so particularly dangerous: coronary heart disease, heart attack, or stroke often catch those affected completely by surprise. You can prevent this through a healthy lifestyle. Regular examinations with a personal blood pressure measurement device make sense for everyone. You will feel safer, you will have an overview and you can provide your doctor with concrete information. After you reach the age of 50, your blood pressure should be checked regularly – no matter how fit you feel. Wrist blood pressure devices are recommended for users up to 50 years old who have no existing underlying diseases. Athletes will also benefit from the practical format and flexibility of this attractive device. 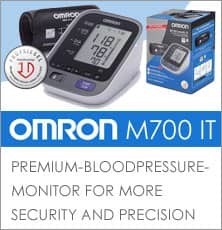 The security and accuracy of the upper arm measurement is particularly suitable for seniors or people with underlying arterial ailments, or even for diseases such as Parkinson’s disease because this often indicates weak vascular blood circulation, which can hamper wrist blood measurements. Also, the upper arm measurements are best suited to persons under 50 years old, who have an existing related ailment or who are rather unathletic. You can't see it. You can't feel it. Yet hypertension – high blood pressure – is the most common illness of our times. Left untreated it can put your health at serious risk, eventually leading to heart disease, strokes and even kidney failure. Usually, the condition only becomes apparent during a routine blood pressure check by your doctor, often while being examined for some other, unrelated problem. But fortunately, there are many ways to treat and manage hypertension, both through medication and self-help including regular exercise and a healthy diet.